MURDER IS OK …. BUT THOU SHALT NOT STEAL! Israel’s military court sentenced an Israel Defense Forces soldier to five months in military jail for stealing equipment from the Turkish aid ship Mavi Marmara, aboard which nine activists were killed on May 31 during a skirmish with Israeli commandos. Under plea deal, soldier who removed electronic items from Mavi Marmara sentenced to 5 months in military jail, fined NIS 700 and demoted. 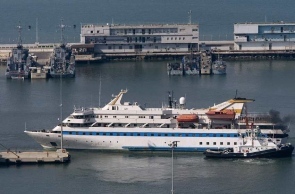 The Mavi Marmara was one of several aid ships involved in a flotilla aiming to violate Israel’s naval blockade on the Gaza Strip and deliver supplies to the impoverished Palestinian territory. The ships were diverted by Israeli forces, with a violent and deadly clash erupting aboard the Mavi Marmara. The cadet, in training to be an officer, was sentenced within the framework of a plea bargain under the terms of which he confessed to having taken electronic equipment. In addition to the jail term, the soldier was fined NIS 700, demoted to the rank of private and removed from the officer training course. Following the sentencing, the soldier expressed remorse and explained that he had made a mistake. According to the plea bargain, the officer took the items from the ship while it was docked at the Ashdod port in September.